A list of candidates for political asylum in Tijuana, Mexico, September 2018. Fear and caution are drawn in the face of Efraín. It’s 7:00 am. A man’s voice announces “480” while the people around listen attentively for their turn outside the sentry box of San Ysidro in Tijuana, Mexico. Efraín asks others for the waiting time regarding the numbering running daily — his family got the number 512 — and someone told them that, if luck smiles at them, they will soon have made it. 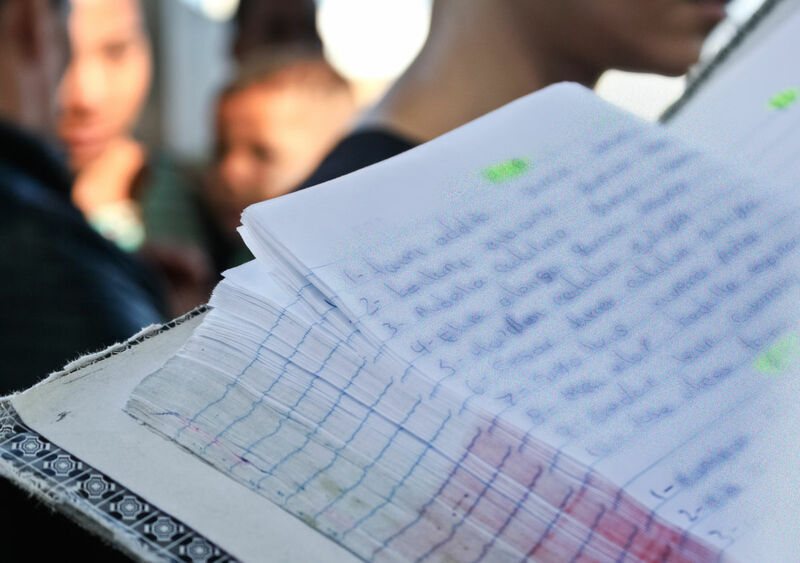 At the site, dozens of parents and children, especially mothers and children, are added to a notebook containing numbers and names. Efraín, his wife and their three children under the age of 14 believe that it will probably take around five weeks until they can cross the border. (Time is not written on the pages of the notebook.) They are coming from Lázaro Cárdenas, Michoacán, Mexico, a place hit by crime, drug trafficking and violence. Days ago, they arrived at the site where the digits represent the door to a new landscape: the United States. Here, they have an appointment with hope. A woman shows her number obtained outside the Garita de San Ysidro in Mexico, September 2018. A child waits with his mother for their number to be called, September 2018. When Efraín explains why he chose to leave, he appears fearful, and at times scans his surroundings. He and his wife are young, not older than 33. His eldest son attended the second grade of junior high school until months ago when they left their community. His daughter Ana Lucia, with large black eyes and restless smile, waits with his youngest son, who innocently invents games to pass the time, too young to realize what is happening. Ana Lucia poses for a portrait at a shelter in the area, August 2018. Efraín feels responsible for what happens. He mentions that his family had already left Michoacán before because drug traffickers were harassing him to join their group. The family decided to move to the US border, but the harassment followed them. One day, only a few minutes away from the border crossing line, neighbors mentioned that there were people waiting for them. Two days later, in the middle of the night, the family fled again. Don Efraín does not know who they were; but for him, the present and future of his family depend on that notebook, and he looks forward to crossing. The drug trafficking, gang violence, and fear of kidnapping and extortion have created an economic crisis in the territories and made it impossible to work. Over the last few months, Tijuana has seen an influx of individuals from all over the country, especially from Guerrero and Michoacán, who are seeking political asylum or humanitarian shelter in the United States. If they are unsuccessful, they will be deported, and all other doors will automatically close. A mother waiting to cross in Tijuana, Mexico, September 2018. A woman spends time with her daughters in one of the hostels for women at the border in Tijuana, Mexico, July 2018. A girl waits with her family to leave for their destination, July 2018. An agent of the National Institute of Migration directs families arrested by immigration authorities to shelters in the area, August 2018. María Galván, a social worker in the “Centro Madre Assunta,” one of the most active migrant shelters in Tijuana, says that in the last year the flow of petitioners increased in spite of the current anti-immigration policies. The shelter has received about 1,700 mothers and children in the last semester, 90 percent of whom are asylum seekers; approximately 85 percent of them Mexicans and the rest Central Americans. Galván has worked as an activist to dignify migration, because he says that the vast majority of those who intend to go to the United States are people in search of peace and a better life for their family. His experience has shown him that migration brings together all social issues, such as poverty, abandonment, grief and lack of education. However, these are very brave people who made the decision to migrate, “the only solution they found,” he emphasizes. Children sit in front of a television and play with toys in a hostel in Tijuana, Mexico, September 2018. Citing its statistics from 2013-2017, the Mexican Commission for Aid to Refugees (COMAR) says the crisis of unaccompanied minors and refugee claims has escalated sharply, and the American Immigration Council has predicted the arrival of 60,000 unaccompanied children. A migrant shelter inhabited by women and children, August 2018. A child plays alone at a shelter as the day comes to a close, July 2018. Walter, along with his 16-year-old son, Anderson, came from El Salvador six months ago, leaving his wife and two 10-year-old children. Anderson had received death threats in his country when he refused to join local gangs. The father and son arrived at the border in search of asylum. However, fearing rejection, they stayed in the border area for a while, working as food vendors in “La Línea.” The money they earn is not enough to live well. After experiencing much sadness, lack of meaning and emptiness of being so far from their family, they decided to add their names to the notebook. The two rent a house next to another Salvadoran named Jacob, who also fled from the violence, and a Guatemalan named Matthew. The latter was deported and separated from his wife, who is an American citizen, and his three children. He lives in Tijuana to feel closer to them, and hopes to return, so they can live as a family. Anderson, 16, counts the dollars he’s earned in a day while working as a food vendor in Tijuana, Mexico, August 2018. A child sleeps beside his mother while waiting for an answer to her request for political asylum, September 2018. Carolina spends time at a shelter in Tijuana, Mexico, August 2018. For the last few weeks, Tijuana and other border areas have been facing a crisis due to the large numbers of requests for refuge. The shelters are at capacity. People don’t know what to do — paying for hotel stays isn’t a solution. The low temperatures of the next months are expected to complicate the situation even more. Dozens of families seeking political asylum head daily toward crossing points along the US-Mexico border near Tijuana, Mexico, bound for the United States. Nadia Tecuapetla is a photographer based in Mexico City. People familiar with US policies toward Central America recognize that the migrants are our responsibility.